The temple is a small and often unappreciated region of the face. The most visible part of the temporal region is situated between the side of the eye and the hairline behind it. It is vertically bounded by where it becomes part of the forehead (anterior temporal line) and the zygomatic arch below. (back part of cheek bone where it extends back to in front of the ear) It is primarily made up of the bulk of the temporalis muscle and its underlying fat pad. Normally, it is relatively flat not being too full or indented. Cosmetic temporal changes do occur and they appear primarily as temporal hollowing or indentations. Too much temporal fullness can occur from overdevelopment of the muscle but this is quite rare. Temporal hollowing can occur from either muscle or fat atrophy. Disruption of the deep and middle temporal arteries is recognized as causing this ischemia. Well known causes are after surgical exposure of the area (neurosurgery or craniofacial surgery), radiation for intracranial malignancies, and traumatic injury. The other recognized causes of temporal hollowing are fat wasting due to automimmune diseases, retroviral medication, and malnutrition. But there is also a cosmetic temporal hollowing that has no obvious causes other than underdevelopment of temporal fullness, what I call congenital temporal hollowing. (CTH) There are some craniofacial syndromes where this occurs but it also appears merely as a cosmetic deformity. In cosmetic CTH, there is an obvious indentation that is about the size of one’s thumbprint just to the side of the eye. (lateral orbital rim) It is not the size of what one would see from larger temporal hollowing from well recognized causes. But it creates a very visible cosmetic indentation that gives an hourglass shape to the side of the face. 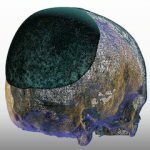 Correction of this form of temporal hollowing can be done by variation of traditional temporal augmentation procedures. 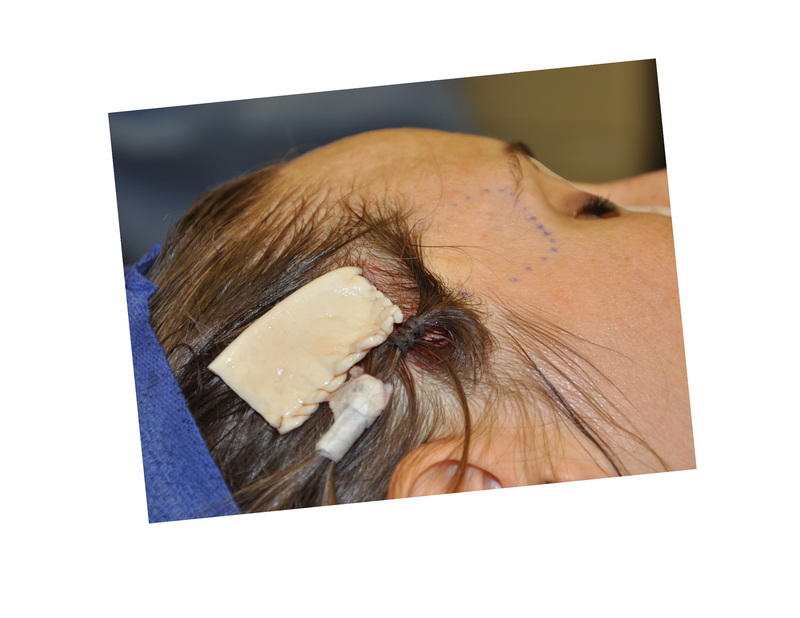 Traditional temporal augmentation procedures require extended scalp incisions and the use of some type of hard and soft tissue synthetic implant materials. But the smaller size of cosmetic temporal indentations do not justify these more invasive procedures. A minimally-invasive temporal augmentation procedure can be done that is both simple and very effective. 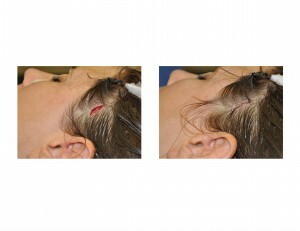 This limited temporal augmentation procedure uses a small 2.5 cm incision located just behind the temporal hairline at the level of the indentation. The incision ends up just below the frontal branch of the superficial temporal artery which is seen just above it during the dissection. The deep temporal fascia is incised and dissection is done in a subfascial plane underneath the indentation out to the lateral orbital rim. This dissection is below the level of the frontal branch of the facial nerve, which is in the more superficial temporalis fascia, so there is no risk of temporary or permanent forehead paralysis. This dissection is easy, quick, and could even be done under local or IV sedation anesthesia. The critical question is what implant material to use. 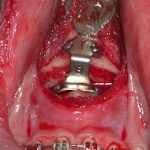 Since the material placement is on top of the temporalis muscle, just about any graft material would work including the full range of synthetic options. But the use of a more natural or collagen-based material is appealing and the recipient site is ideal. I prefer the use of allogeneic human dermis of which many tissue bank providers exist. (e.g. Alloderm, Dermacell) With thicknesses of 1 to 1 ½ millimeters, it can be layered for increased thickness and cut to any shape. It is easily inserted in a flat or rolled configuration. Enough graft is placed to just slightly overbuilt it. The incision is closed with tiny dissolveable sutures. No dressings are used. 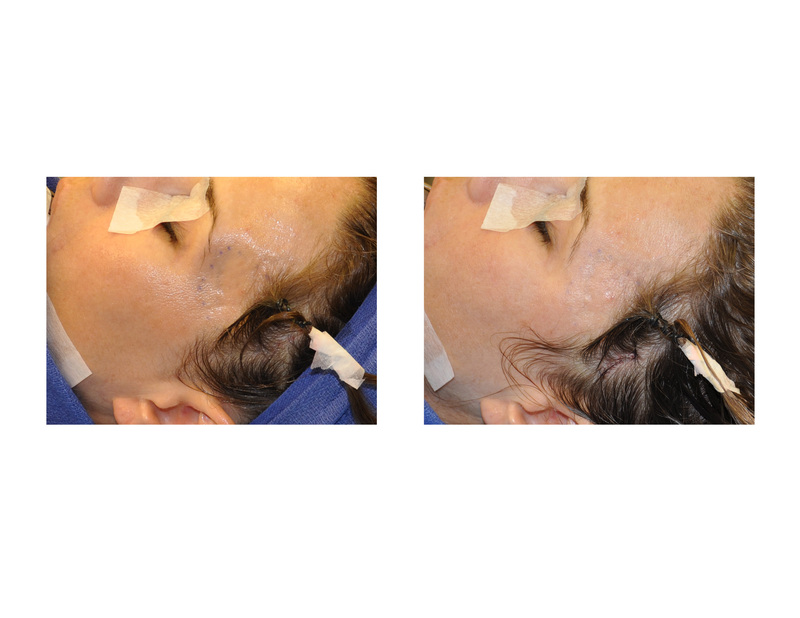 The results of the dermal graft temporal augmentationprocedure are immediate and very satisfying. 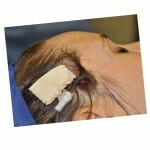 There is no wound care needed with the incision in the hairline. One can shower and wash their hair the next day. There will be some mild swelling and occasionally a little bruising if the fascia attachments along the lateral orbital rim need to be released to get a smooth contour. 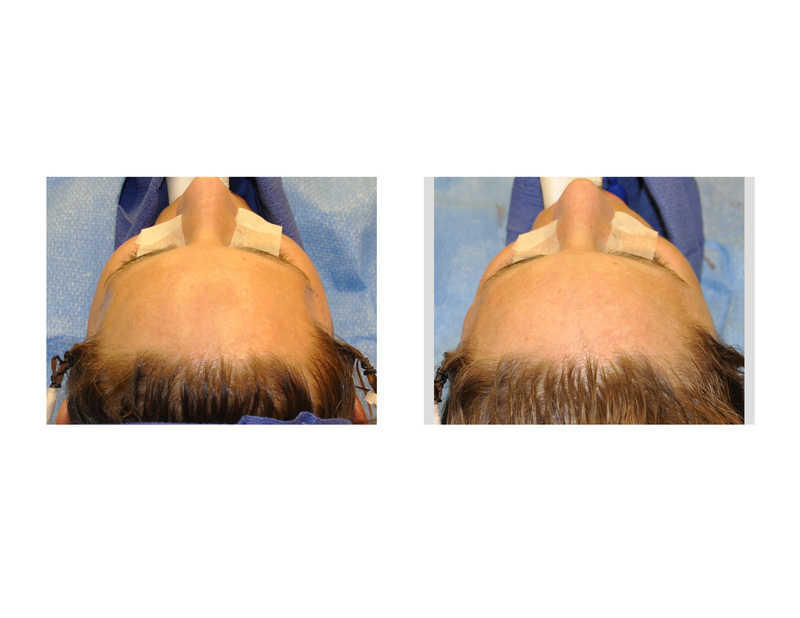 With dermal grafts, the final volume outcome should await the six month after surgery time period. But their placement in muscle bodes well for long-term volume retention.